Our apartment is a half block from the Danube River. 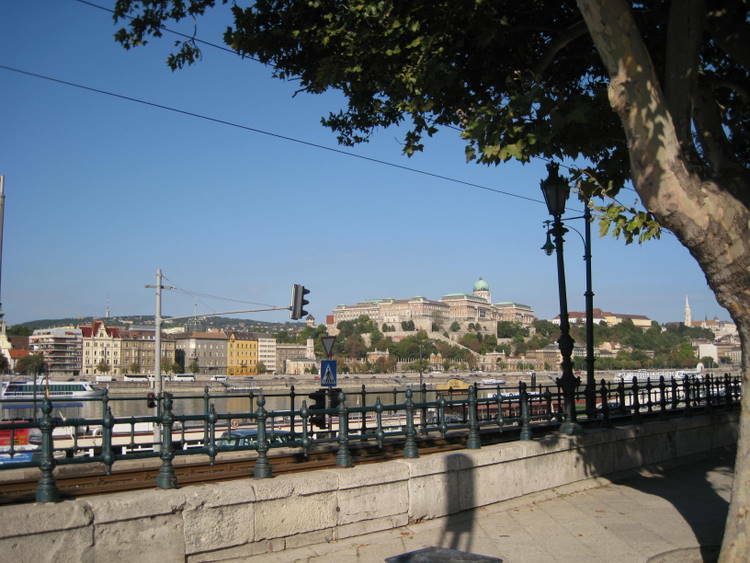 Across the river is the Buda side and up on the hill is the palace. It is a wonderful view. This morning we had a 10:00 appointment to tour the parliament building. It is on the Pest side of the river. We made reservations a long time ago because tour tickets are very hard to find. We took the #2 tram right to the building. My wife had the email with the reservation. The guard looked at both of our driver’s licenses, and sent my wife to the office with both licenses. I had to stay outside the roped area. I had a “small world” experience while waiting in line. People always ask each other where they were from. There was a lady with her two grown daughters who said she was from Atlanta, Georgia. I said I used to live in LaGrange, Georgia. She said she was raised there and told me her maiden name. I was Rector of St. Mark’s Episcopal Church in LaGrange from 1969 – 1978. I knew her parents although they were not members of St. Mark’s. She had gone off to college in 1966 so she had left LaGrange when I served there. We knew a lot of people in common and had a great time talking about old times. Sitting on the edge of the Danube on the Pest side of the cities is one of the largest and most beautiful buildings in Europe. The building designed by Imre Steindl was supposed to be finished in 1896 for the Millennial Celebrations, but wasn’t completed until 1902. The building measures 880 feet long and 404 feet wide at its center. The central dome is 315 feet high and its interior has 691 rooms and over 12.5 miles of corridors. The design is a combination of a Renaissance dome, a neo-Gothic façade which stand on baroque base. I have recently acquired a model of this building and am anxious to start it. The tour group was a small group of English speaking folks. The inside is beautiful with a lot of gold leaf. The Grand Staircase starts at the front door and ends in the Dome Hall. 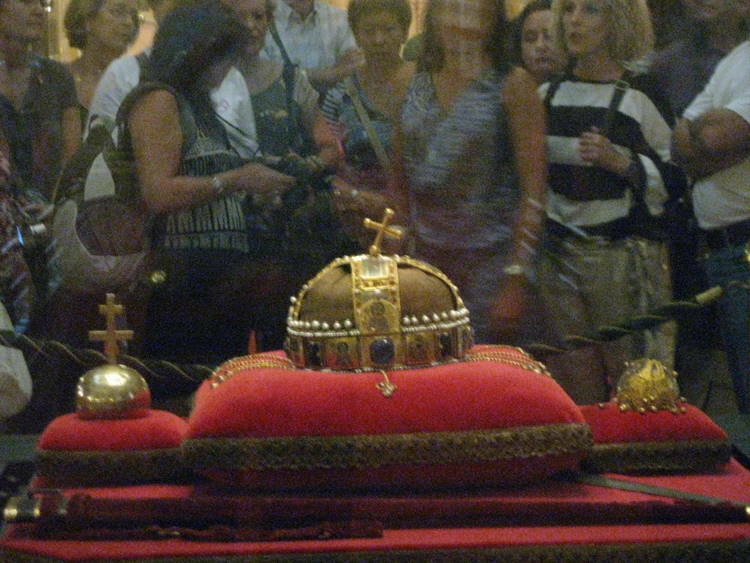 We got to see the Holy Crown which is inside the dome, the changing of the guards and inside the parliament chamber. The tour lasted about 45 minutes. 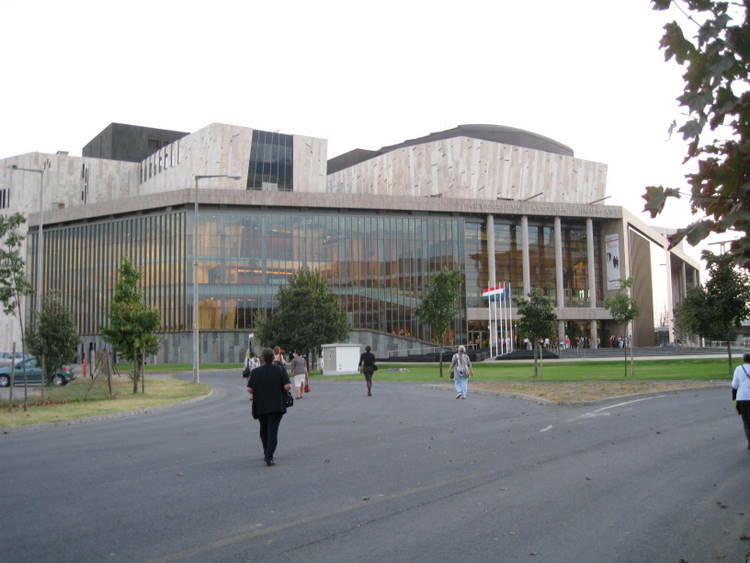 This should be a must on everyone’s visit to Budapest, but get your tickets months in advance. After our tour and saying good bye to our friends from Georgia, we started to walk across the Chain Bridge (I have a model to make). My wife, who doesn’t like bridges, changed her mind so we found a bus to take us across. The Chain Bridge, built in 1849, was the first bridge of connect Buda and Pest. Chain Bridge was blown up by the retreating Nazis in World War II, but was quickly rebuild. 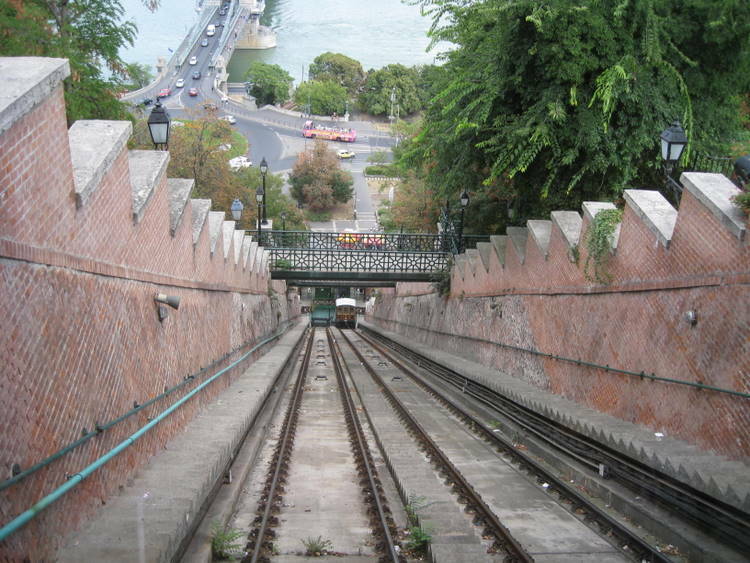 At the end of the bridge is a funicular that goes up to the palace. The view of the Pest side of the Danube, especially the aerial view of the Parliament is spectacular as you ascend the 849 foot hill. It was a beautiful day with a clear blue sky. After exiting the funicular, you see the large statue of an eagle. 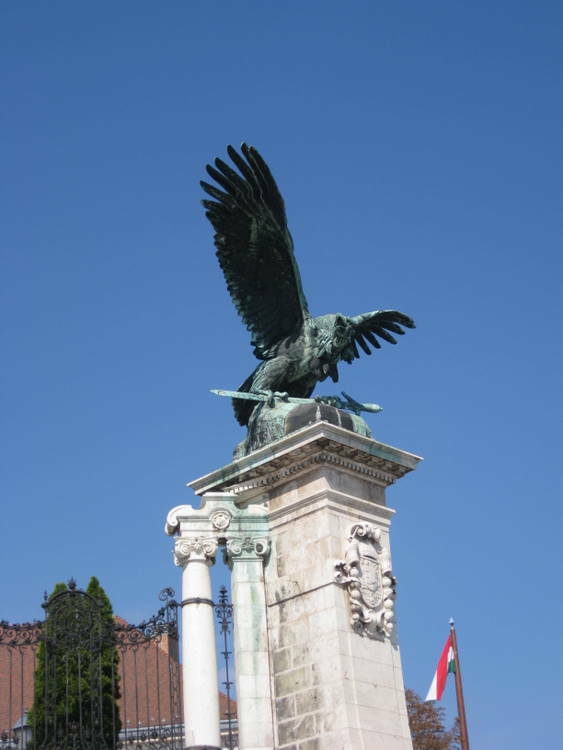 This is the Turul, a mythical winged beast that is the symbol of the Arpad dynasty kings of Hungary. We walked down into the palace but it appeared to be no way out as the entrances were all guarded. Finally we found an exit. The palace dates back to the 13th century and has a long history of destruction and restoration. In the 14th century it was expanded and took on the Gothic style of the time. In the 15th century, it was remodeled again by King Matthias in the Renaissance style. It suffered damage when the Turks took Buda in 1541 but nothing compared to the destruction by the pan-European Christian army which liberated Buda in 1686. A new building was built by King Charles III of Habsburg during the years 1714-1723 and was later expanded by his daughter, the empress Maria Theresa. A fire in 1810 and the War of Independence in 1848 caused considerable damage. It was rebuilt only to be gutted by the Red Army during World War II. It has been completely restored and serves not only as the residence of the Prime Minister, but houses several museums. We saw a lot of security everywhere as we left that area. No one was being allowed in. 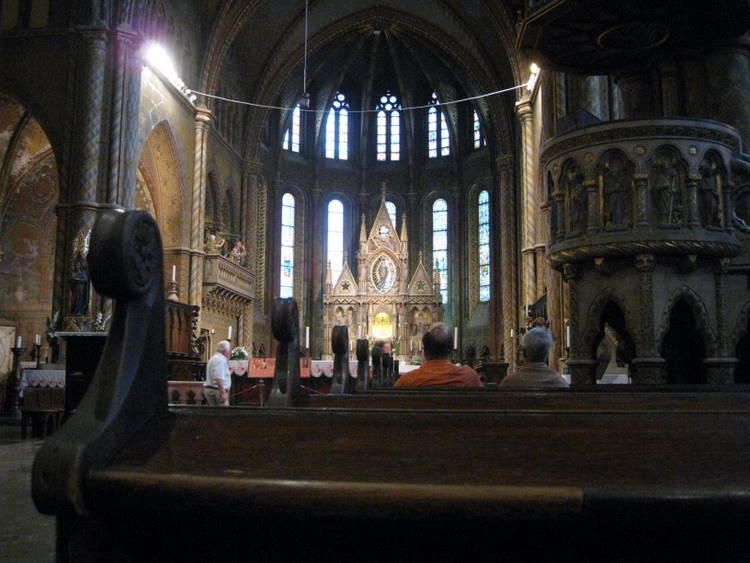 We walked to St. Matthias church. I had just finished my MODEL several days before the trip and was anxious to see the huge tower and all the little pinnacles. I took many photos of all the detail. Before going into the church, we decided to eat. My restaurant expert wife had read about this great restaurant called Icon in the Hilton Hotel, next to the church. We had a wonderful lunch and an unbelievable view looking down across the river. I had a veal schnitzel and my wife had salmon. After lunch we went in the Matthias Church. 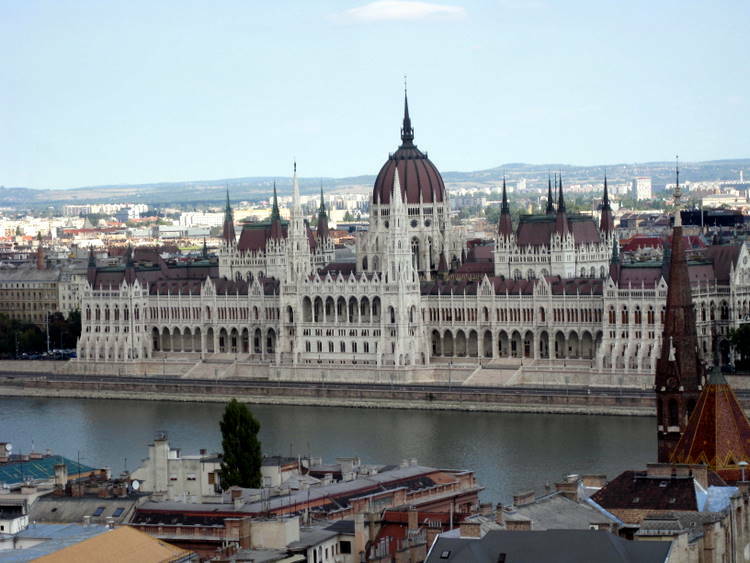 Matthias Church stands high on the Buda side of the river not far from the Royal Palace. 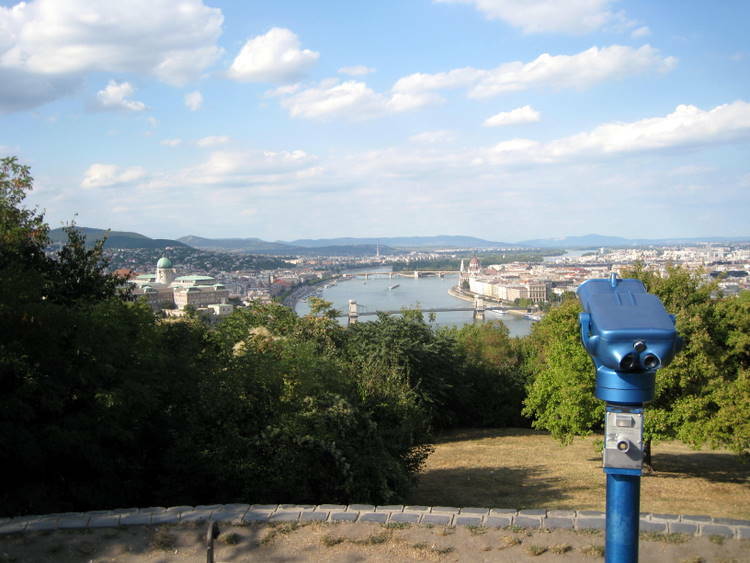 It is very visible from the Pest side of the Danube. It takes its name from King Matthias, who donated its two towers. The official name is The Church of Our Lady. It was built in the 13th century. The church suffered terrible damage during the 150 year Turkish occupation. 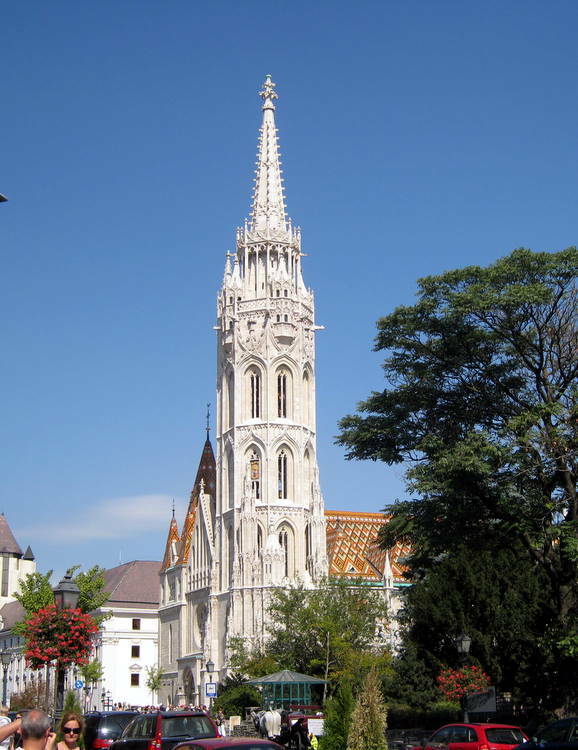 After the capture of Buda, the church was used as the city’s main mosque. During that time, all of the ornate frescoes were whitewashed and its furnishings were completely stripped. After the overthrow of the Turks, attempts were made to reconstruct the building in the baroque style, but they were unsuccessful. In 1723 a fire ruined the church and 25 years later it was struck by lightning. 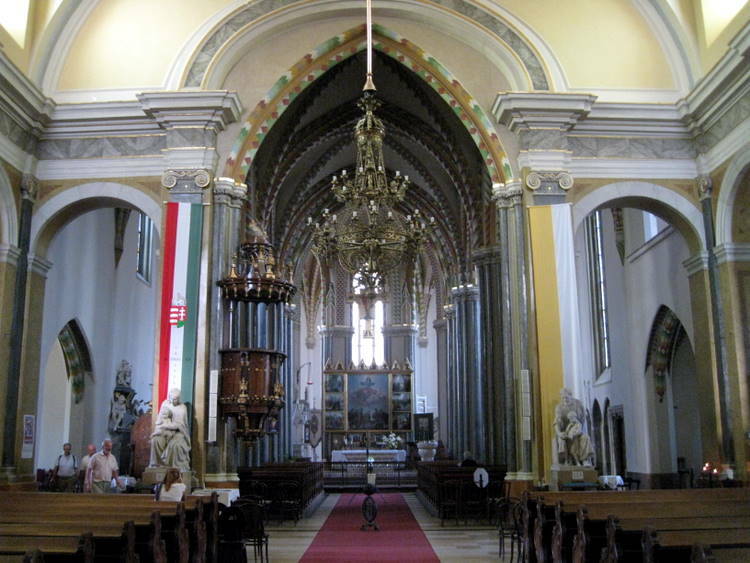 At the end of the 19th century the church began to regain its former splendor after a 23 year restoration project. The architect, Frigyes Schulek, added the diamond patterned roof tiles. The interior wall and ceiling are covered in colorful geometric patterns, amazing frescoes and stained glass windows. There are also gilded altars, a stone pulpit and many coats of arms. The second story featured some historic displays as well as wonderful vistas of the interior of the church. There was a bookstore that carried the model that I had made. I got into a conversation with a lady who was interested in my models and gave her my card. I think she was from Ohio. Click here to see the model of Matthais Church. 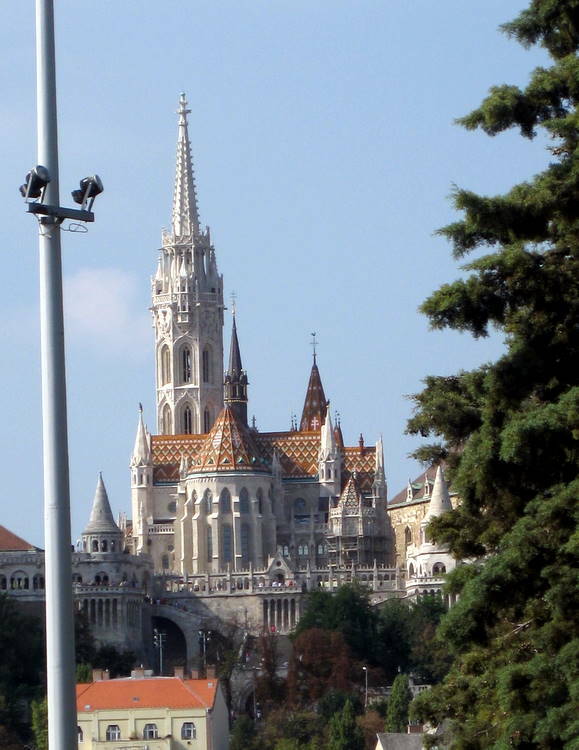 Behind Matthias Church , is a large, intriguing structure know is the Fishermen’s Bastion. 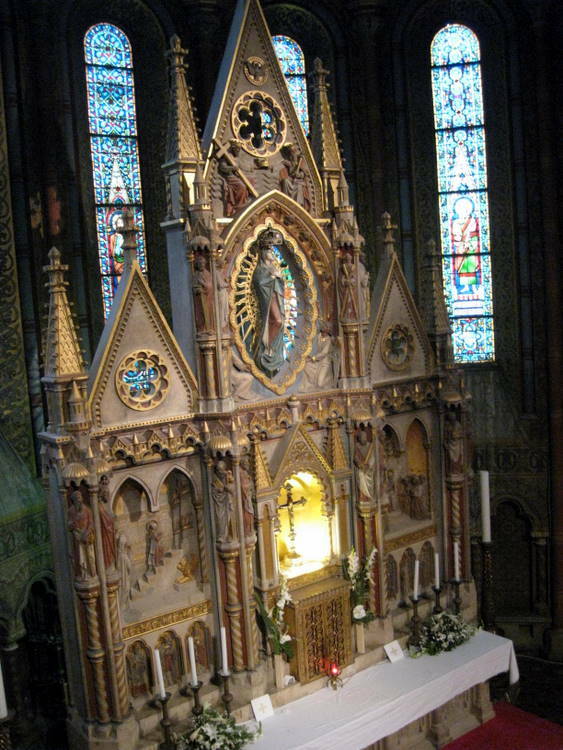 It was built in 1905 by Frigyes Schulek who had designed some of the additions to Matthias Church. It is of a fairy tale design complete with turrets, parapets, and flowing staircases. 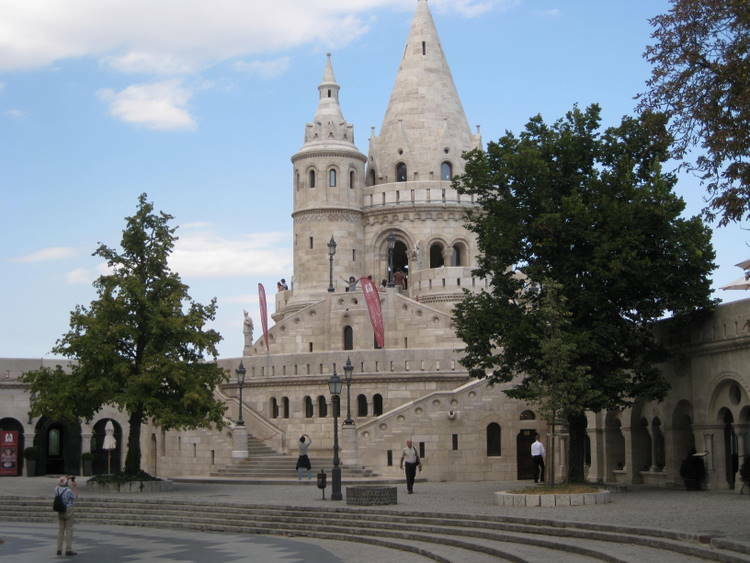 In part neo- Gothic and neo-Romanesque architecture, its seven round towers are meant to represent the seven Magyar tribes that came to Hungry in 896. There are balconies along the back side which provide breathtaking views of the Danube River and the Pest side of the city. The name came about because a local fish market used to be located behind the church during medieval times and it was the Fishermen’s Guild that defended this part of the Castle grounds in the 18th century. In front of it is a large bronze equestrian statue of St. Stephen. 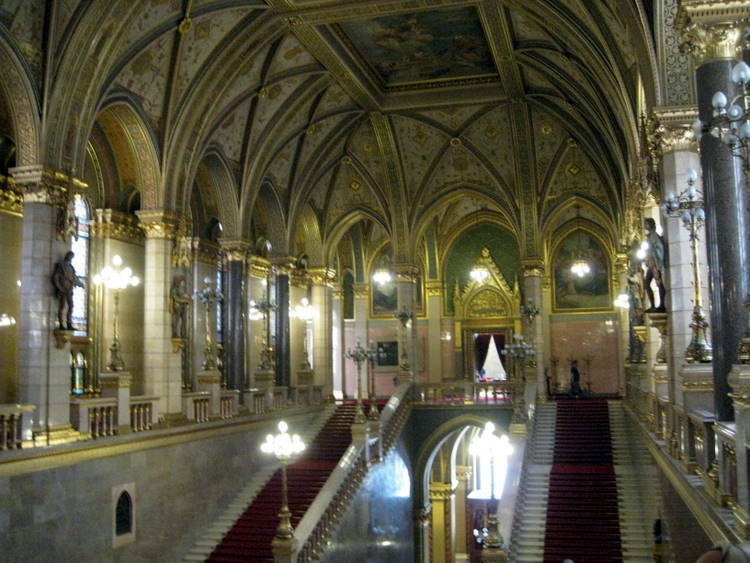 As I earlier wrote, when we arrived at the palace, the security wouldn’t let anyone in the area of the funicular. We had bought round trip tickets. We had decided to buy a Hop on, Hop off ticket but couldn’t find the bus stop. By the time we got back near the funicular the security was gone so we went back down on the funicular. We wanted to go to Gellert Hill. We asked several people which bus and got on the one most people suggested. As we approach the area at the bottom of the Gillert Hill, we decided to get off the bus and ask further directions. 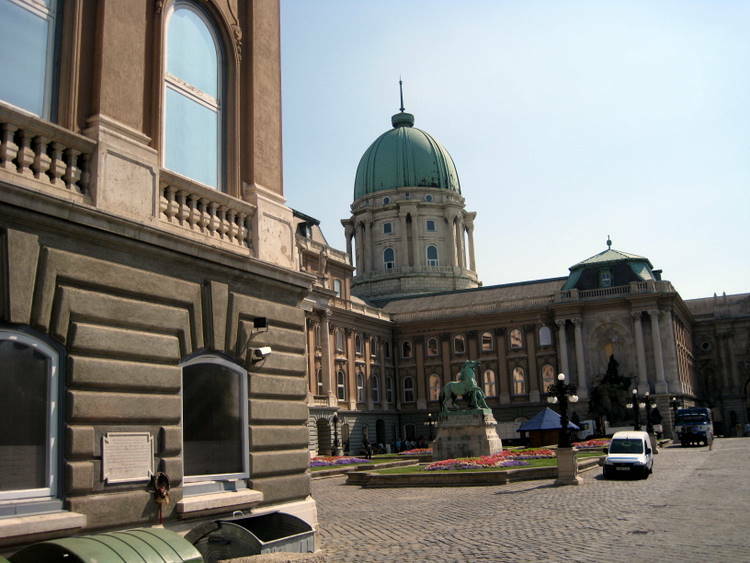 We were opposite the Gellert Hotel, so we went to the hotel and asked the concierge for directions. He a very kind man. He suggested a taxi and took us out and negotiated a rate for us. The taxi took us to the top of the hill. 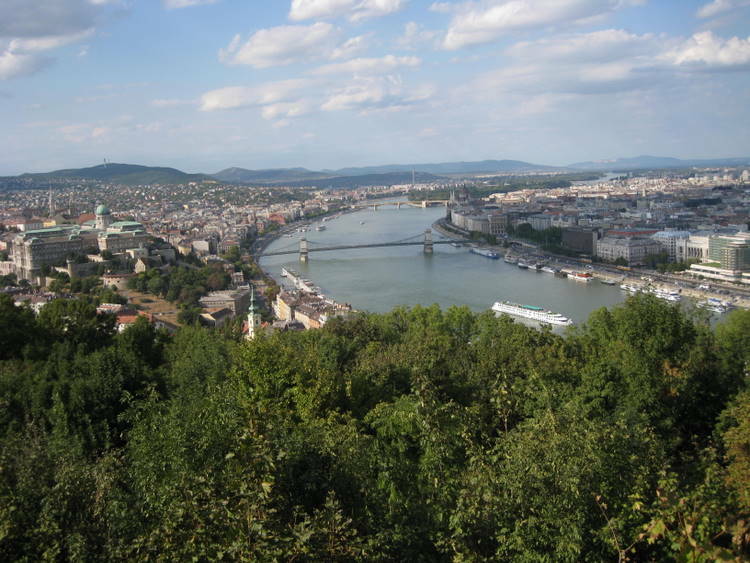 Gellert Hill rises 450 feet above the Danube. From below on the Pest waterfront, the statue of St. Gellert can be seen high upon the hill. The statue is built into the hill surrounded by a colonnade. The statue and the hill were named after Abbot Gellert, a Benedictine, who was important during the Magyars’ conversion to Christianity under King St. Stephen. 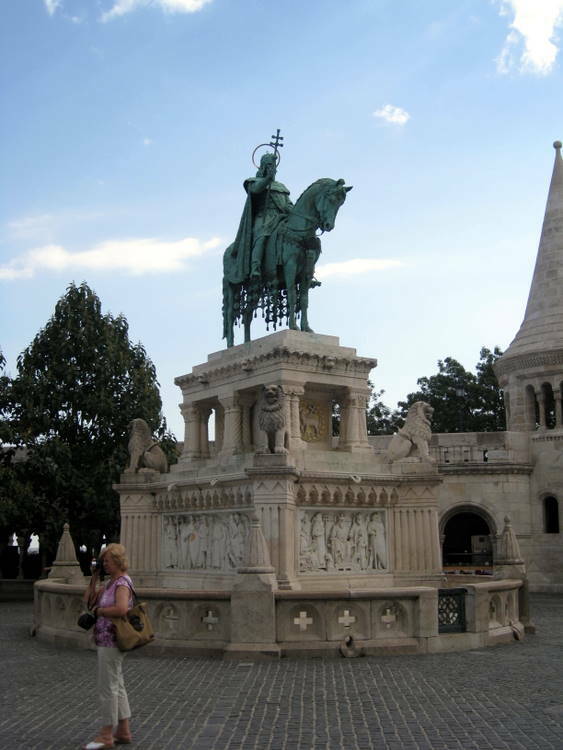 Legend has it that following the king’s death, Gellert was seized during a pagan rebellion in 1046 and thrown down the hill in a barrel full of nails. There were a number of tourist buses on the hilltop. We talked to several people from the US who were on a tour. Again it was a beautiful day and the views breathtaking (as well as the height). There is a citadel with a museum on the top. The Citadel was built by the Habsburgs between 1850 and 1854 in order to better control the city after their successful suppression of the Hungarian War of Independence. Today it is open to the public. Outside were numerous stalls that sell the usual souvenirs and books, and several small cafes. Inside was a small hotel and a museum. We decided not to go in as we were concerned on how we were going to get back down. The taxi driver told us that we might have a hard time finding transportation back down. We got a flyer on the “Hop on Hop Off “ bus and decided that it was worth the price – at least we could get back down near our apartment. The ticket for this bus was for two days with a number of stops in the city plus a river cruise. 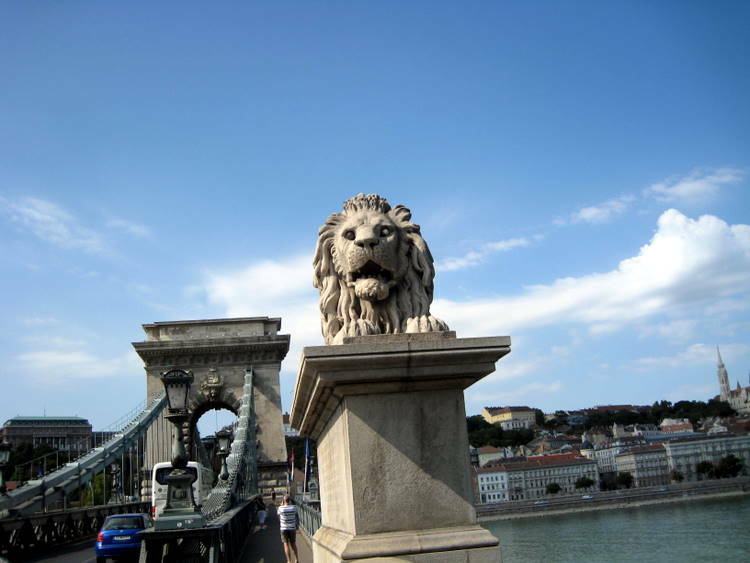 We took the bus back down the hill and it stopped at the Pest side of the Elizabeth Bridge near our apartment. 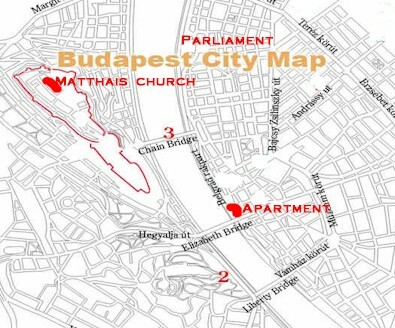 The Inner City Parish Church is located at the end of the Elizabeth Bridge near our apartment. 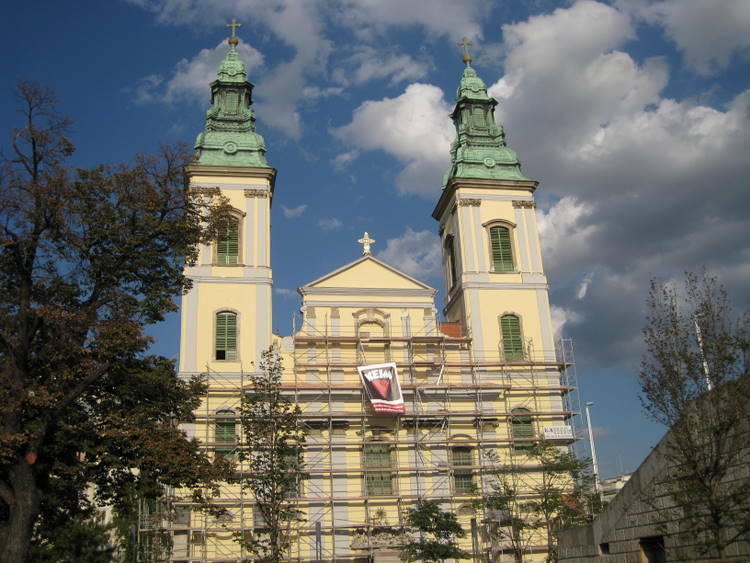 It dates back to the 12th century and is the oldest church in Pest. It is the site of St. Gellert’s grave. The church has undergone many changes of the years. It operated as a Gothic hall church in the 15th century, and a mosque during the Turkish occupation of the 17th century. After a tremendous fire in 1723, it was rebuilt in the baroque style. When the Elizabeth Bridge was build after the war, they had to put the church on wheels and moved it a little. The eastern half of the side of the church was old stone and the other half was yellow stucco. They w ere working on the front which had scaffolding on it. We went inside where we had to pay a few coins to take photos. It was a baroque interior. We went back to our apartment for a short time to rest. We went out again, stopped out at an outdoor café on the Vaci Utca (Vaci Street around the corner from our apartment) for a drink, then to McDonalds for a “gourmet dinner”. 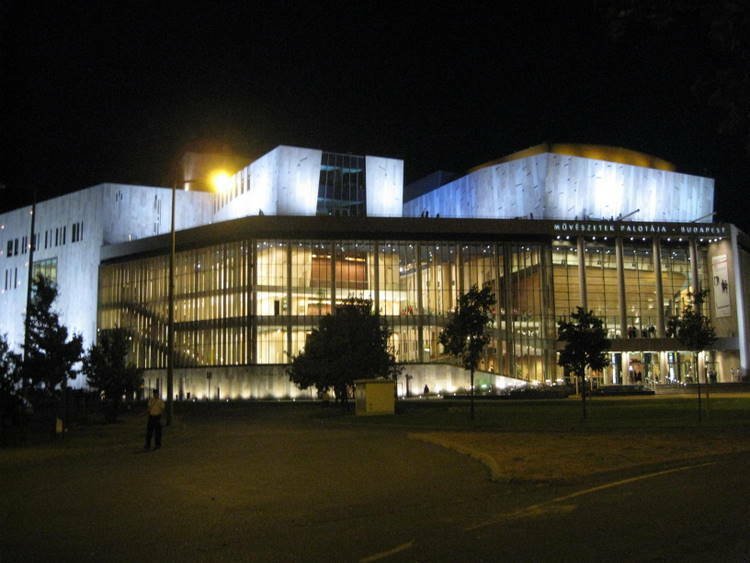 We had eaten a big lunch, and we needed to get down the road for a 7:00 P.M. concert at the Palace of Art. It was a 15 minute tram ride south along the River. My wife had wanted to see this building as it was new and modern. We had read online about a free organ recital. When we went in to the ticket office, they said we had to have a ticket for a reserved seat. It was free. We didn’t know we needed a ticket even though it was free, and we were concerned that we wouldn’t get into the concert. 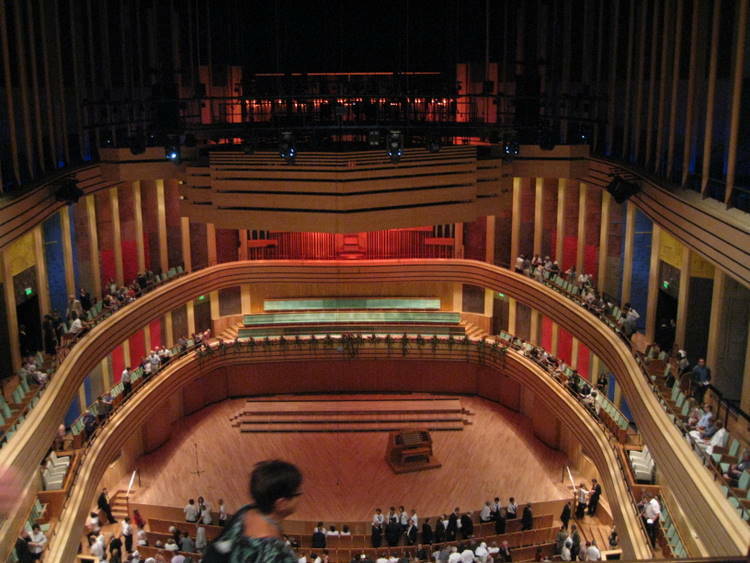 We really wanted to see the Bela Bartoch hall, as well as hear the music. The concert hall was full and our ticket was for the next to the last row in the 4th floor balcony. The space was huge and very modern. We didn’t have a program and didn’t recognize the music. Even though we enjoyed the music very much, we decided to leave at the intermission as we had had a long day and needed to get back home and get to bed. It is hard to say which city we like best, but Budapest is really beautiful as was the weather the past three days…rather hot though. We found more signs on stores in English than we did in Prague or Berlin. 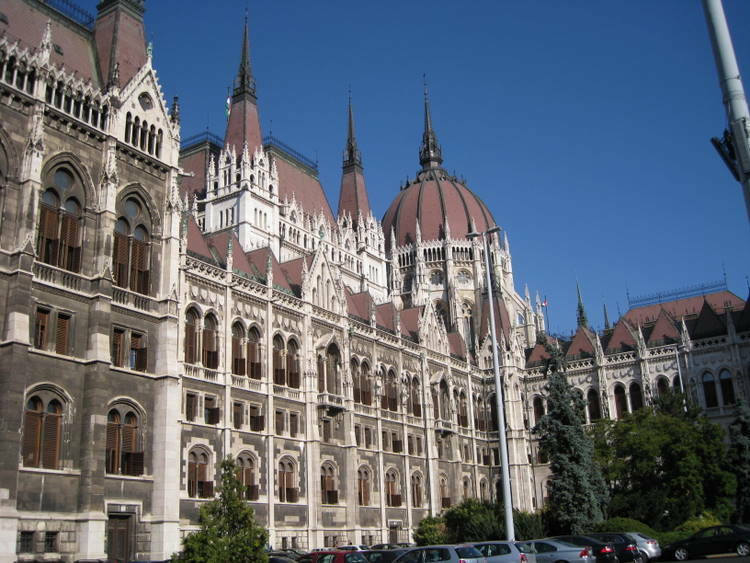 Budapest also suffered during WWII. Before we let home my wife had finished a book called “The Invisible Bridge” by Julie Orringer. It is about Budapest and Paris during the beginning of the war. I brought it along and am about half through it. We both highly recommend it.